One out of every 700 babies born in the United States has Down syndrome, making it the most common chromosomal disorder in the country. Fortunately, because it is so prevalent, doctors have become very knowledgeable on how to help people with Down syndrome live full lives. In fact, it's not unusual for people with the disorder to live independently, play competitive sports, or start a business. But while many of us are familiar with the physical and emotional characteristics of people with Down syndrome (such as flattened facial features and developmental delays), not everyone understands why some people are born with the condition. 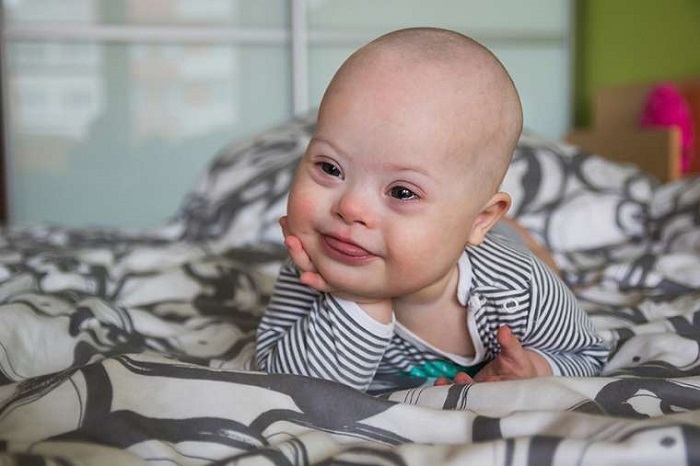 Here's everything you need to know about what causes Down syndrome, including the factors women who give birth to babies with Down syndrome often have in common. Every cell in the human body contains genes, which house the information that determines which traits you inherit. These genes are grouped along rod-like structures called chromosomes. Most of us have 23 pairs of chromosomes, but people with Down syndrome have a full or partial extra copy of chromosome 21, Diane Cicatello, MD, a developmental pediatrician specializing in Down syndrome, tells Health. There are three different ways this can happen. About 95% of people with Down syndrome have a type called trisomy 21. With this type of Down syndrome, each cell in the body has three copies of chromosome 21 instead of the usual two copies, Dr. Cicatello explains. The next type is translocation, which occurs when the cells have an extra part or whole chromosome 21, but it's attached (or trans-located) to a different chromosome instead of being its own separate chromosome. The third, called mosaic, happens when a mixture of two different types of cells is present in the body. People with this type have some cells with three copies of chromosome 21, but other cells contain the typical two copies of chromosome 21, Dr. Cicatello says. It's possible for those with mosaic Down syndrome to have fewer symptoms because they may have a smaller number of cells with abnormal chromosomes. Many believe the misconception that a parent can pass the gene for Down syndrome to their child, but it's not an inheritable disorder, Dr. Cicatello says. Rather, it's caused by a mistake in cell division during early fetal development. There is, however, a small exception to this rule. The gene for the translocation type can be passed from parent to child, but this only happens in about 1% of all Down syndrome cases, making it pretty rare. What are risk factors for having a child with Down syndrome? Giving birth at an older age is the greatest risk factor for having a child with Down syndrome, Dr. Cicatello says, explaining that mothers who have a baby past the age of 35 are considered to be at an increased risk. A 35-year-old woman has about a one in 350 chance of having a child with Down syndrome. That number gradually increases, and by age 40, it reaches 1 in 100. All pregnant women can be screened to determine the likelihood that their baby has Down syndrome. If the screening results are positive, diagnostic testing can then be done to confirm whether or not the child has the disorder. Your doctor can help you navigate options for screening and testing. Though Down syndrome isn't considered inheritable, if you already have one child with Down syndrome, you do have an increased risk of having another, according to Mayo Clinicthis link opens in a new tab. Genetic counselors can help mothers in this situation determine their risk of having a second child with the disorder. Can you prevent Down syndrome? There's no way to prevent Down syndrome, though you can consult a genetic counselor to fully understand your risk. The good news is that people with Down syndrome can live extremely full lives, Dr. Cicatello says. The key is finding a team of experienced professionals (such as a pediatrician, speech pathologist, and physical therapist) as early as possible, she believes. The care your child receives in the first years of life can set them up for a brighter future. Down syndrome doesn't have to limit their potential.